Why did I watch this again..? And why didn't I hate it? I somehow feel, that being an adult male, I am NOT this show's target demographic. But I'm not going to say "Oh this is just boys looking good for desperate girls!" I watched the first episode, the whole way through. Why? I'll never know. There seems to be no other reviews, so I guess it's my civic duty to write one. This show, (At least, judging from the first episode, so things MAY change, but I somehow doubt it) is OK. Not great, not awful, just OK. There really isn't anything that struck me as BAD in this show, yet there were only a few things that struck me as GOOD. Sure, the characters are all archetypes we've all seen before, but what are you going to do? I gave up on complaining about that a long time ago... They're not BAD. They're just generic. I think the main draw is the musical numbers, where the animation switches to a sort of 3D type thing. It looks nice, if not a bit jarring. I am fairly sure the story is just an excuse to get to those parts, but thankfully the story isn't the worst one ever. Bottom line, if you're into AMVs, are a fan of male idols, or is just really, REALLY bored, go ahead. Watch it. I can tell you right now this won't be your favorite anime ever. I can also tell you this won't be the worst one you've ever seen. It's just... is. At first glance it looks like the typical otome style: cute idol guys aims for the same dream. But it lacks the one thing that makes it typical otome: a female MC to bring them all together and that is probably my favorite thing about it. They aren't inherently good at what they do, they're not trying to help just one person be better, they're strive for their dreams, to find their own happiness, in their own way. Past the "aim to win" and a bit of "let's all be friends!" plot points I'm not really sure what the overall goal of the show is but I can't help finding myself drawn in by the characters, who have a great balance of comedic and stoic moments. Each week I find myself waiting for the next episode to see just what hurdle in the idol world they overcome next. The first reviewer is 100% correct. Basically it seems to follow the standard line of idol type anime. Its not so terrible that you cant finish an episode but also not so amazing you are going to be counting the days to the next one. This is good for those moments you have no clue what else to watch and you are running out of options. Before when I saw this anime I was like, "its going to be another anime about the main character wanting to sing because it was his dream. And while working towards his dream he faces some trial and error and enemys." Dream Festival is what you expect of an Idol anime, it depicts Trainee life in a glamorous way and you almost want to join a agency after watching this. But as a music Anime there are a lot of better alternatives, and if you ain't a big fan of CGI, this won't be your cup of tea. 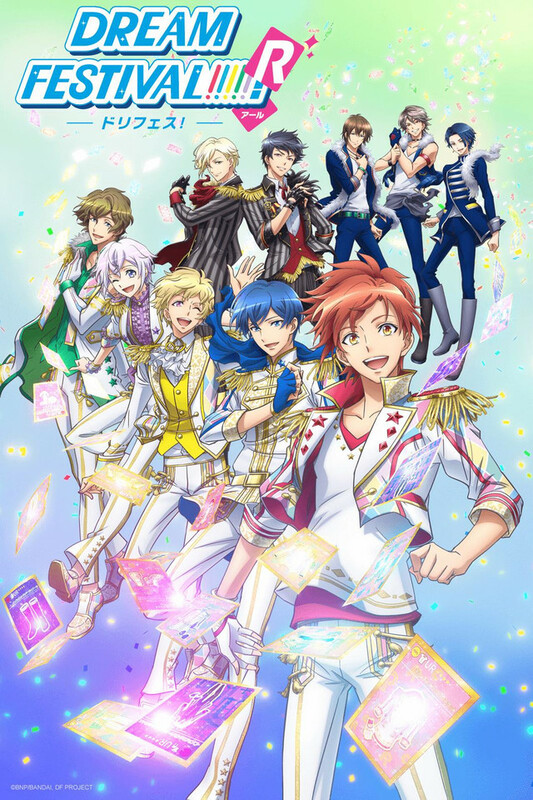 I just want to start out by saying I have a burning hatred for idol anime, and to me, this is nothing more than a run of the mill idol anime. The characters are a little less an average, being cardboard cut-outs of actual personality. The main character was frankly unbearable, being an annoying cliche of an anime character. Most the characters are the same way with sad excuses of character development. The songs are average, but the animation in these sequences is pretty awful and hard to look at, though I can understand why they have done this for budget sake. None of the animation is special or stands out, and that also applies to the story line. The story line is bad, like, a story written on wattpad by a 13 year old girl. If you like idol anime, then this is your piece of cake, though if not, its nothing special and not very good, though I may be a little too hash. Me like most like idol anime for stupid reason it eye candy with little story. Whole there are stand outs most fail in the story department in the end it all sounds the same but you ignore it because you know why your watching. This one adds more challenges and the added Dorika part to the formula and makes a little better to watch. It a fun ride. I will say this if this is a game which I think it is sign me up to catch all the cheers. second season saw me trying to watch this. i feel i fall pray to these singing anime thinking that there will become better but they don't it another anime that goes no where. the characters don't grow the story line stall and the graphics and taglines are worst every time i am just going to quit sorry and yes i will take a star for my trouble don't bother.